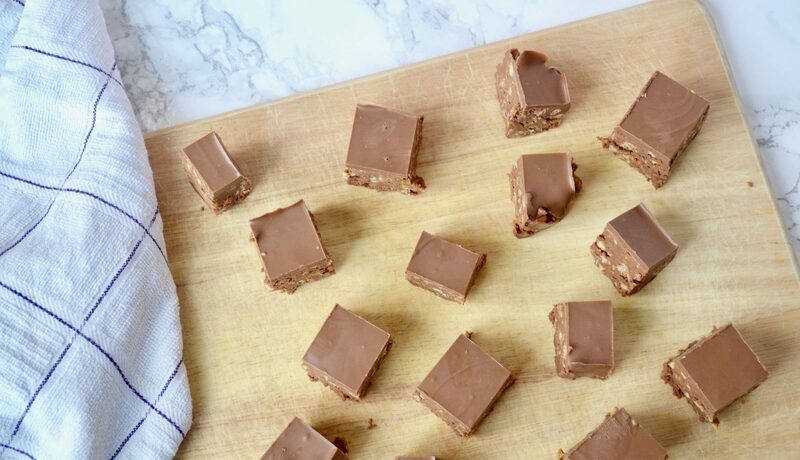 Tiffin is one of those recipes that you can make with just about anything – just find something crumbly, and add a load of chocolate and that’s about it! I remember making tiffin when I was younger a lot as it was one of those things that you could make without needing to use an oven, and so it was relatively safe for me to make without supervision – which probably meant I ate quite a lot of the mix too! Ha! 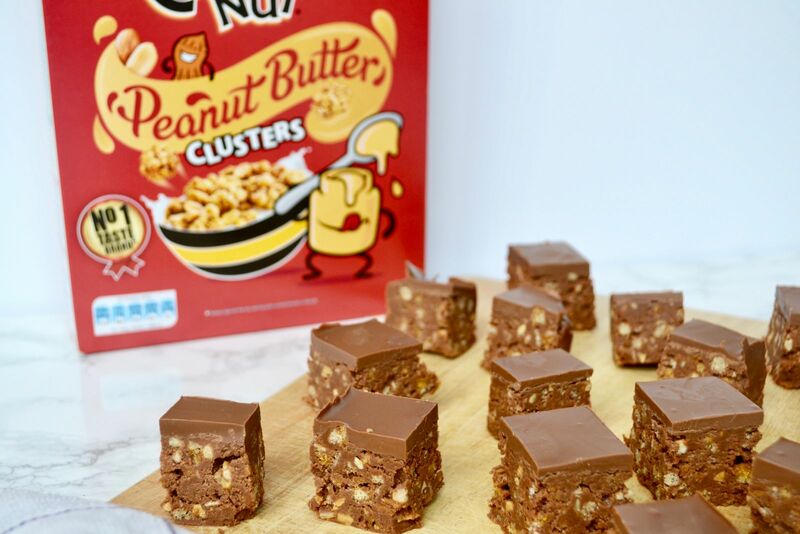 This particular tiffin is a real treat, because what combination is better than peanut butter and chocolate?! I wanted to try making tiffin with added peanut butter and using Peanut Butter Crunchy Nut as my “something crumbly”, and it actually turned out really well! M even said it tastes like Toffee Crisp, which I will totally take – love me a toffee crisp! Line the tin with Greasproof paper. 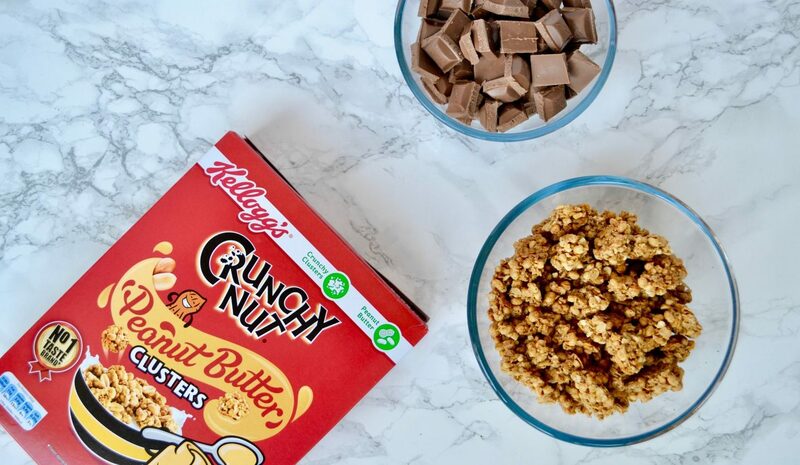 Place in the microwave for 30 seconds and stir again, Repeat as necessary until the chocolate is completely melted – this won’t take as long as you think as the syrup gets really hot and helps to melt the chocolate so be careful not to overdo it! 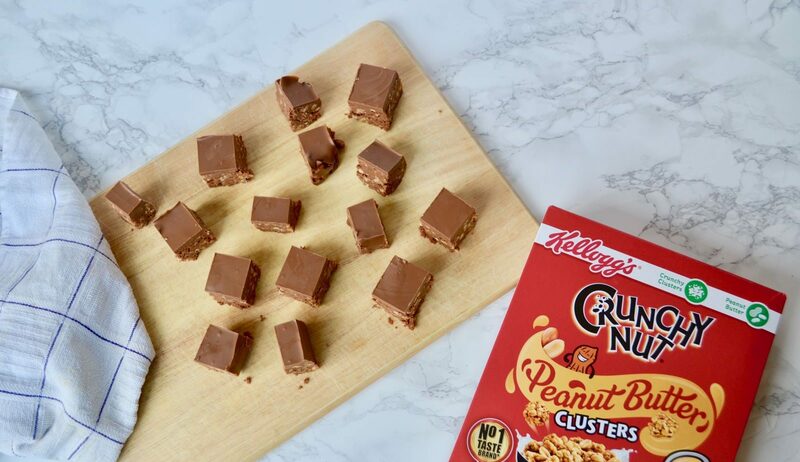 Pour the Crunchy Nut Clusters into a sandwich bag and crush with a rolling pin until completely crumbled. 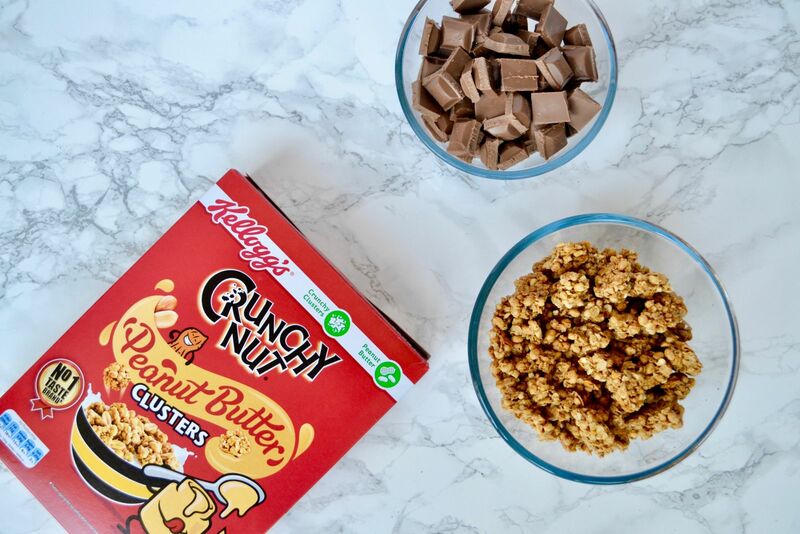 Add the crushed Crunchy Nut Clusters and Peanut Butter to the Melted Chocolate mix and stir until completely combined. 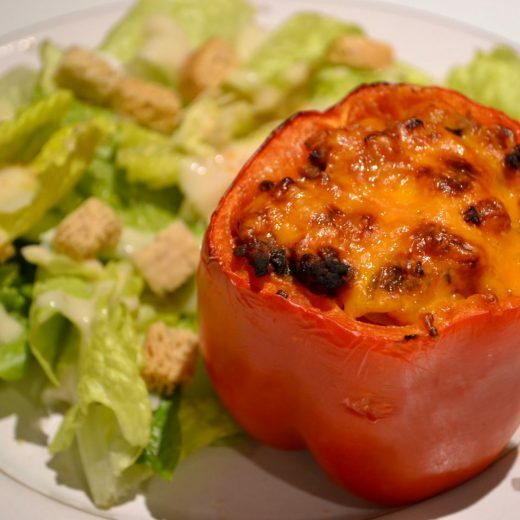 Pour into the tin and place in the fridge until set – should take about 45 mins to an hour. 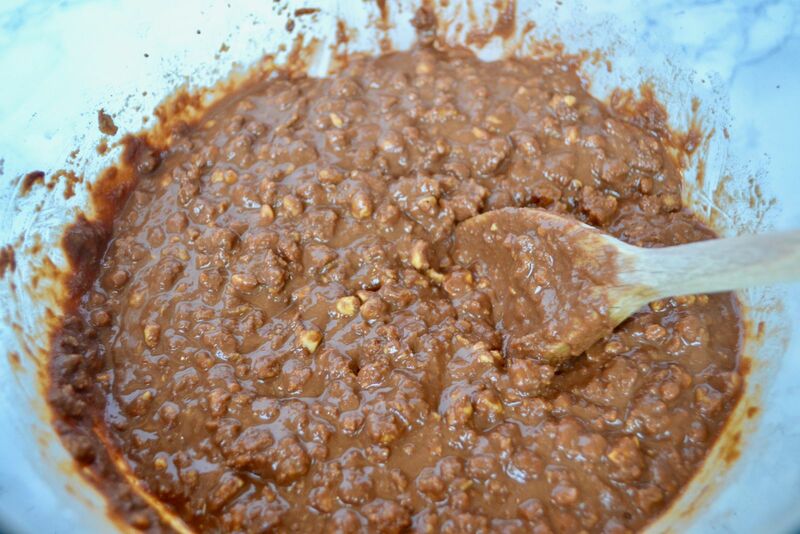 Melt the remaining 200g Chocolate in the microwave until smooth. Pour over the top of the Tiffin and place back in the fridge for 20-30 minutes until set. Cut into bitesize pieces – it will be crumbly underneath, but if you use a nicely sharp knife it’ll cut well. Snow, Wine, Food and some amazing skiing!